Items can be returned to us for a full refund within 14 days of purchase provided that they are in fully resellable order. If you wish to return an item outside of the 14 days then they could be a 20% restocking charge incurred. If an item is damaged or not working as described then the item can be returned to us for a full refund or we can send you out a replacement. What size gas cage do I need? If you are having trouble picking the gas cage that is right for you then please see the what size should I go for page. If you still are having trouble then please contact us and we help you determine the right one for you. 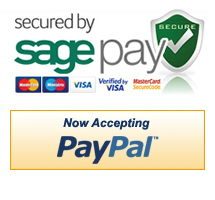 All our payments are taken on a secure server either by SagePay or by PayPal. Please check when entering any credit card details online that the site is secure by looking for the green padlock around the url address bar depending upon what browser you are using. Can I resell the products? Of course! If you want discounts on bulk quantities then please contact us and we can give you some price breaks.